Wow, is that a gorgeous cover or what? 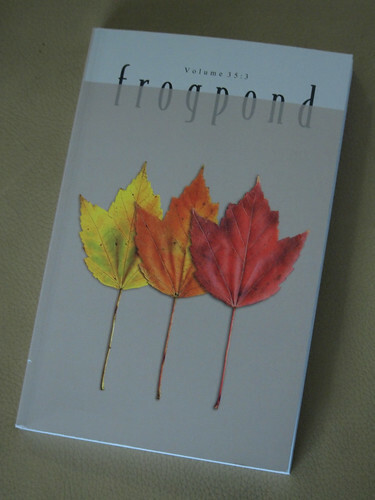 It’s by Chris Patchel, with Frogpond under the new editorship of Francine Banwarth. Isn’t that exactly how repetition isn’t redundant. I like the ambiguity in reading it if the turn is after line 2, or after L1’s “of”. Is it that fear is contagious and someone who is afraid of everything causes other people to shy away, afraid of catching that. Does even her own shadow quake at her temper? I like the psychology look, the empathy. Is someone fierce someone who externalizes fear to gain control and power so her anger is actually fear? Emergency Hallelujah (2008, Mansfield) surreal and beautiful elegant poems by Jason Heroux which on finishing I immediately set out on re-reading. A Web of Holes by Shannon Maguire (2012, above/ground) also a lovely design. the chapbook will launch this Saturday with Parapagus.